Make your own Squad mods with the Unreal 4-powered editor. 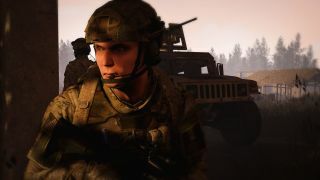 Early Access, multiplayer-focused military shooter Squad is "exceptional" so far, according to Ian Birnbaum. But you know what makes "exceptional" things even better? Modding tools. Well, we're in luck. Unreal announces that Offworld Industries' Squad now has a Development Kit, and if you're wondering why Unreal has announced it, that's because you'll need Unreal Engine 4 to use it. You'll find a link to the Squadding tools in the Unreal launcher once downloaded, and judging by the screenshots, I'd say that some experience with UE4 will come in handy. There's a Squad Discord Hub and a Wiki should you need any help. If you're looking to buy the game, Offworld has just announced that it will be in the Steam summer sale, which seemingly starts today. It will be available for 25% less than the usual price. In that post, the dev also states that vehicles will arrive in the game in late July.